Fairly expensive but completely worth the investment for those with 1-bit desires. Battery powered with USB drag-and-drop to computer. Versatile, with 1-bit recording options. Records to SD card in several formats including MP3, WAV and DSD. The built-in XY mic makes the MR2 suitable for recording sound just about anywhere. As well as being highly portable, the MR2 is great sounding and very versatile. Housed in a high-quality casing, the MR2 looks and feels top notch, while being compact enough to fit into a large-ish pocket. This makes it perfect for carrying around with you, ready to record anything at any time. Unlike the MR1, the MR2 does away with hard disk recording altogether and instead opts for SD or SDHD cards (up to 32GB in size). This makes a lot of sense, as hard drives are fragile at the best of times, while SD cards have no moving parts, which is very important for longevity, particularly for a recorder that isn't cheap, and is largely designed to be moved around and thus likely to be knocked over or dropped on the ground. The MR2 can record in MP2, MP3, WAV (BWF broadcast wave format) DSDIFF (which is a 1-bit audio file format used in pro audio SACD devices), DSF (another direct streaming digital format found in Sony devices) and WSD (which is yet another 1-bit audio file format). Recording times differ according to the recording format used and size of SD card but a project can be anywhere up to six hours in length and typical figures (per 1GB of card memory) are around 600 minutes for recording in MP3 format at 44.1/192kbps, 55 minutes for WAV at 48kHz (24-bit) and up to 22 minutes per gig of card memory using the highest quality 1-bit Direct Stream Digital formats. All-in-all there's plenty of time available in all formats. Power-wise, the MR2 can run off USB bus power or three AA batteries. The MR2's screen is fairly easy to read and informative, while the learning curve is pleasingly small and we were recording and playing back in seconds. Thankfully, the interface is slick on the whole too and the function hierarchy is pretty easy to get your head round - perfect for when you may only have seconds to set up and capture. One of the most appealing features of the MR is the built-in stereo XY configuration mic, which can be rotated in 30 degree clicks (up to a total rotation of 210 degrees) so that it's always pointing at the source regardless of the unit's placement. There's also a line input, external mic input (with plug in power for powering certain condenser mics, but no full 48v phantom power) and a headphone output. Note that the MR2 can also be mounted on a camera tripod for stability and to help with rumble elimination. Sound-wise, the microphone performed excellently in just about any context, either moving around recording noises outside for sound library work or capturing piano in the studio, the line input produced very high-quality results too. Nuances in sounds and dynamics are captured well, the stereo imaging is great and we would have no hesitation using recordings made with the MR2 in any commercial releases. You could easily record a string quartet or percussionist with just the MR2 and bring the files straight back into your computer using the provided USB 2.0 connection (the MR2 shows up as a standard hard drive on your computer for drag-and-drop convenience). 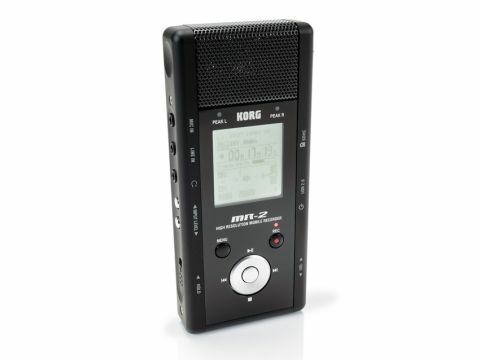 In all, the MR2 is versatile, generally easy to use and a very good sounding product, though it's not cheap - only regular field and library recorders will see the real value in portable 1-bit - but it's one of the best and its flexible features will only sweeten the deal.